This 1950 Traditional style home was originally sited near LAX but moved to its present location and was expanded in 1971. Extensive updates include new paint inside and out and refinished hardwood floors. The updated sunny kitchen features pretty quartz countertops and new stainless steel appliances and is adjacent the separate laundry room. The three generous bedrooms each offer wonderful closet space. The master bathroom and hall bathroom have been updated beautifully. New landscaping and irrigation in the front and back yards provide lovely outdoor dining and play spaces for true indoor/outdoor living. The large street-to-street lot offer endless opportunity for backyard fun! Just across the street is the very adorable Lanark Shelby pocket park. 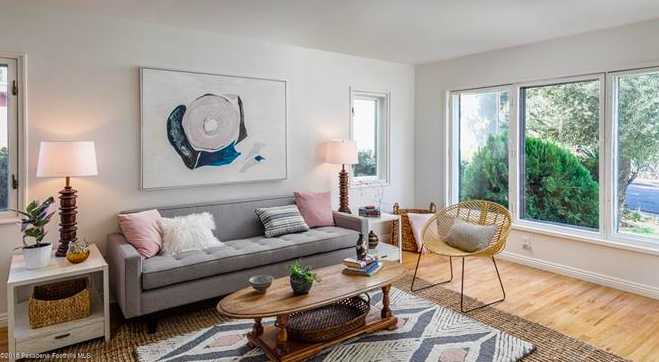 Situated in the middle of all that’s wonderful in Los Angeles, this home stands near to Eagle Rock, Highland Park, Pasadena and the 2/134 freeways.